Context-aware systems are systems that use context information to adapt their behavior or to customize the content they provide. 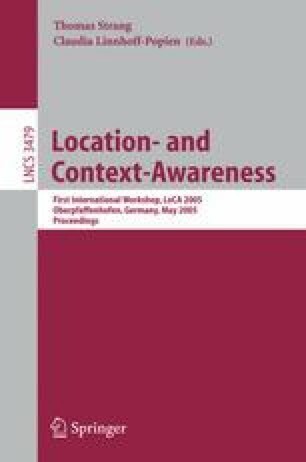 Prior work in the area of context-aware systems focused on applications where context sources, Context-Aware Services (CASs), and users are in each other’s spatial proximity. In such systems no scalability problem exists. However, other relevant CASs are subject to strong scalability problems due to the number of users, the geographical distribution of the context sources, the users, and the CAS as well as the number of organizations that participate in the provision of the context-aware system. In this paper, we classify CASs according to their scalability needs and review context provision and service provision infrastructures with regard to their scalability. For building large-scale context-aware systems it is not sufficient to Zuse large-scale service provision and context provision infrastructures. Additionally an integration layer is needed that makes the heterogeneous access interfaces of the context provision infrastructures transparent for the CASs. We outline our proposal for such an integration layer and describe how it can be combined with an infrastructure that allows handhelds themselves to gather context information in their immediate vicinity via wireless technologies.